How does it compare to the world's best smartwatch? Apple has just revealed its new Watch Series 4 alongside a trio of iPhones at a media event in California. The new smartwatch features a larger display, updated operating system and a suite of advanced health features. 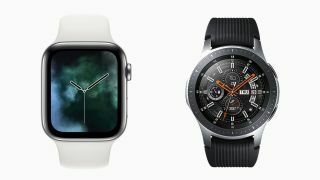 The new Apple Watch launches just weeks after Samsung unveiled the Galaxy Watch, which we recently named as TechRadar’s best smartwatch in the world. With Google opting to remain on the sidelines for a while longer, derailing our hopes of a Pixel Watch launching imminently, the battle for smartwatch supremacy returns to a two horse race. To help you decide if your next wearable should come from Apple or Samsung, here’s how the new Watch Series 4 measures up against the Galaxy Watch. Samsung and Apple take two markedly different approaches to smartwatch design with the respective wearables. The Samsung Galaxy Watch has a circular touch screen display with a rotating bezel for scrolling through the operating system; size options for the Samsung are 42mm and 46mm, referring to the diameter of the case. The Apple Watch, meanwhile, has a more rectangular design and a touch screen to match. It does not have a rotating bezel, but instead employs the rotating Digital Crown to aid with navigation through its watchOS interface. New for the Watch Series 4 is a crown with haptic feedback, clicking subtly beneath your fingertips as you scroll through lists. Apple continues to offer two sizes of Watch for 2018, but where all previous generations included cases of 38mm and 42mm, the Series 4 stretches this slightly to 40mm and 44mm. This growth is down to the new wearable having a larger display, which is 30% larger than the Series 3 and accommodates more complex faces showing the wearer more information at once. These size options make the Apple Watch 4 the slimmer of the two and more suited to those with smaller wrists - or just consumers who prefer a more compact timepiece. Meanwhile, the Samsung is more suited to those who want a larger smartwatch. As for color options, Samsung sells the 42mm Galaxy Watch in black and rose gold, while the larger 46mm is only offered in silver. Things are a little more complicated with the Apple Watch Series 4. The GPS model, which has Wi-Fi but no LTE, comes only with an aluminium case, while the GPS + Cellular model can be bought in stainless steel or aluminium. All models are offered in silver, grey or gold. On top of this, there is the Nike+ version in silver and space gray aluminium, and the Hermes collection in polished stainless steel with a range of luxury leather straps. The AMOLED display of the Samsung Galaxy Watch measures 1.2 inches across on the 42mm model and 1.3 inches on the 46mm, and both have a resolution of 360 x 360. The Series 4 Apple Watch has a resolution of 368 x 448 on the 44mm model, and 324 x 394 on the 40mm version. The Apple Watch’s square-sided display is better for reading text and interacting with most apps than the round screen of the Samsung, which tends to cut off the corners as you scroll. But then the Samsung feels more watch-like, with its digital faces resembling actual watches instead of the mini-computer-on-your-wrist look of the Apple Watch. Both Samsung and Apple have included heart rate monitors on these smartwatches, and accelerometers mean they can track your daily steps and exercise, too. The Galaxy Watch uses its heart rate monitor to keep an eye on your stress levels, giving you a nudge to chill for a minute and breathe if it sees a spike which can’t be attributed to exercise. The Galaxy Watch’s included fitness app automatically recognises and tracks six different exercise activities, but if you jump into the app and set things up yourself, it can log forty different sports and exercises, like running, cycling, weight-lifting, yoga and much more. Water resistance to 5 ATM means the Galaxy Watch can track your swimming too - a stat matched by the Apple Watch Series 4. Meanwhile, new for the Apple Watch Series 4 is the ability to take an electrocardiogram (ECG), a medical test used to check your heart’s rhythm and electrical activity. This marks the first time than an over-the-counter device can do this, and it has earned certification from the US Food and Drug Administration. The ECG (also known as an EKG) is taken by opening an app and placing the index finger of your hand not wearing the watch onto its Digital Crown. The Watch Series 4 then records your heart rhythm classification and saves the data, ready to be presented to your doctor as a PDF on your iPhone. Also new for the Series 4 (and unique among today’s smartwatches) is the ability to alert you to an abnormal heartbeat which may be a sign of Atrial Fibrillation (AFib). However, both of these new heart monitoring features will be US-only when they launch later in 2018. It is hoped that Apple will gain certification in other countries, including the UK and Europe, soon. What is available at launch, is a feature where the Watch Series 4 detects when you fall over, and can be set to automatically call the emergency services. A key difference between the smartwatches of Samsung and Apple is that only the former works with both Android and iOS, whereas the Apple Watch works exclusively with iPhones, leaving Android owners out in the cold. That said, the Galaxy Watch’s support of iOS is limited compared to how it works with Android and specifically Samsung smartphones. As ever, the Galaxy Watch runs Samsung’s own Tizen operating system, while the Watch 4 comes with Apple’s watchOS 5. For us, Apple’s software has a narrow lead over Samsung’s, with more apps being produced by a larger network of developers. We’re also fans of the Watch’s Taptic Engine, which alerts you to notifications with a firm tap to the wrist, rather than a mere vibration. Inside, the Apple Watch 4 is powered by the company’s own S4 system on a chip, which boasts a 64-bit dual-core processor, while the Galaxy Watch runs on the Exynos 9110 dual-core 1.15GHz chipset. As for RAM, the smaller 42mm Galaxy Watch has 768MB and the 46mm model is packed with 1.5GB. Apple isn’t one to immediately reveal the RAM of its watches, so we’ll have to wait until the Watch 4 goes on sale to find out the exact figure. It’ll be a similar story with battery capacity. We know the Samsung Galaxy Watch has a 472mAh cell, far larger than the 279mAh battery of the year-old Apple Watch Series 3, but the Watch 4’s bigger screen and body should mean a small increase here. Apple is yet to reveal the exact size of the battery, but says the Series 4 can achieve the same 18 hours of battery as the Series 3, which is considerably less than Samsung’s claims of up to four days on the 42mm Galaxy Watch and up to seven days for the 46mm model. However, our testing found the larger model lasted around four days. Storage for the Galaxy Watch is 4GB, while the Apple Watch Series 4 has 16GB. The Samsung Galaxy Watch is priced at £279 / $329 for the 42mm model, and the larger 46mm version costs £299 / $349. On the other hand (or wrist), the pricier Apple Watch 4 costs from £399 / $399 / AU$599 for the 40mm model with a rubber sports strap and GPS. Up the case size to 44mm and the price jumps to £429 / $429, while the LTE versions of each size starts at £499 / $499 / AU$749 and £529 / $529 respectively. As ever, Apple offers a large range of Watch models, with prices heading to £1,000 / $1,000 for Hermes examples, and reaching £1,499 / $1,499 for the flagship. All that said, the basic functionality of each Apple Watch 4 is identical regardless of what you pay (LTE inclusion notwithstanding). The winner ultimately comes down to which smartphone camp you currently sit in - iOS or Android - and what you value most from your smartwatch. The Samsung Galaxy Watch has a far superior battery life, meaning nightly sleep tracking and less bothersome recharging, while the Apple Watch is available in more variants to help match your personal style, and Apple’s work with ECG and health monitoring sets it apart. The Watch 4 is also more likely to suit slimmer wrists, or will be preferred by those who are put off by the Galaxy Watch’s bulkier design. Although, having said that, larger timepieces are all the range in the traditional watch industry, so being chunkier doesn’t mean the Samsung won’t have its fair share of adoring fans. As for which is best - and if Apple can regain the top step from Samsung - we’ll have to reserve judgement until we get hold of the Apple Watch Series 4 for ourselves.